← Packages in Java with Examples…!!! From the above statement we can understand that we need to create a package which all the information of the students.Then we need to use the data in student information package in a class which displays the final report about the students. Before creating a package we need to create a folder of any desired name.Then we need to place the code of the package class in the folder and compile the package without execution(Because it does not contain main method).Now we shall write the package which contains the roll numbers of the students as the data in it.I’m going to store about five roll numbers of the students. 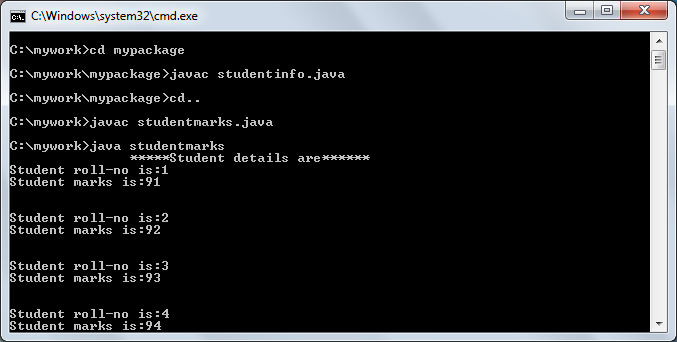 Here the method studentinfo() is a constructor we it calls implicitly when an object for class studentinfo is created. Now we shall write program to use package. You can download package and the program. This entry was posted in Java and tagged benefits of packages in java, how to create user defined packages in java, java sample code, java sample programs, packages in java with example program, sample package program in java, simple program of packages in java. Bookmark the permalink.